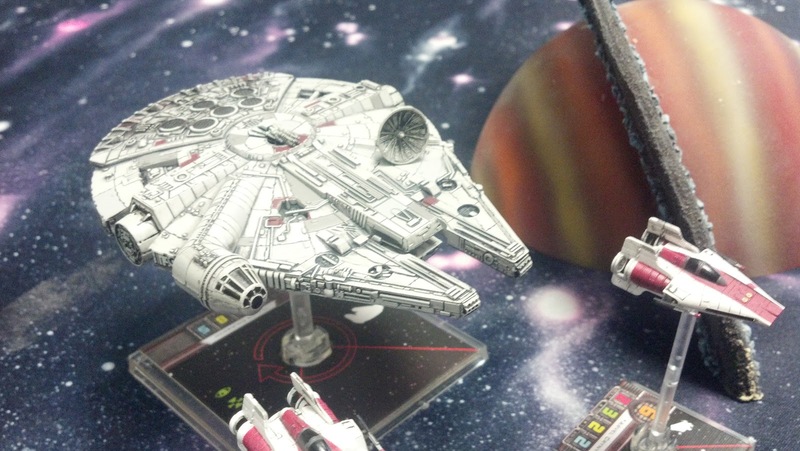 Hi I just played the Kessel run tournament at Game Depot today and It was allot of fun. I showed up with two lists, a light side and a dark side list. I ended up playing light side, and there were allot of light side players during the tournament. I was all set to play Luke, Wedge and Horton as my fleet of ships, with Ion cannons, R2-D2 and photon torpedoes to fill in the gaps, but when I sat down i noticed that two other players were planning on running the same list or something just like it, so being me, and wanting to be different, I made a new list on the fly. We were required to turn in lists and the dead line was vastly approaching so I scribbled down the first list I could think of and turned it in, it took about 5 seconds for me to immediately regretted it. It was not the best list, I decided i wanted to go mostly Y-Wing with one heavy hitter, So I took Horton with an Ion cannon, 2 gold Squadron Y-Wings with no upgrades and Wedge as my heavy hitter with R2-D2. Point total came out to 99 points. The games went really well for me, The first player I faced was a rebel player who had one Y-Wing and 2 X-wings, this seemed to be the default setting for most rebel lists. 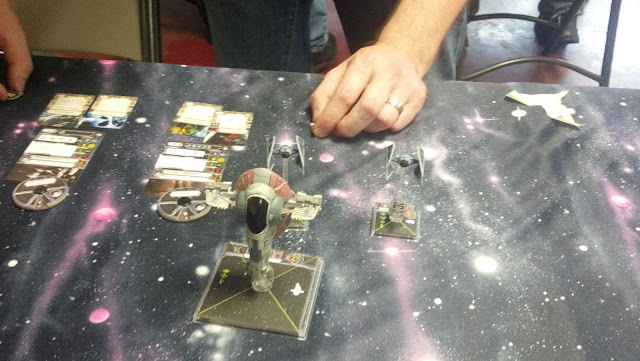 He had a neat set up where he put R2-F2 on Bigg's X-wing. 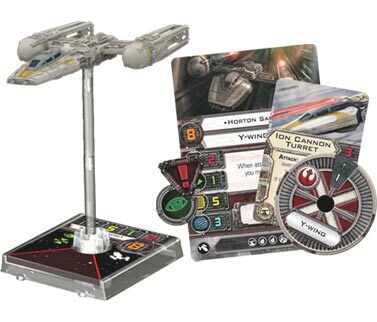 R2-F2 has an ability that allows you to spend an action to gain a point in maneuver, and Bigg's has the rule that if he can be targeted he must be. So making his defense bump up to 3 dice it made him quite the effective shield vs most lists, but since he had to face my wedge who takes a defense dice away from his targets, I was able to destroy him quickly. 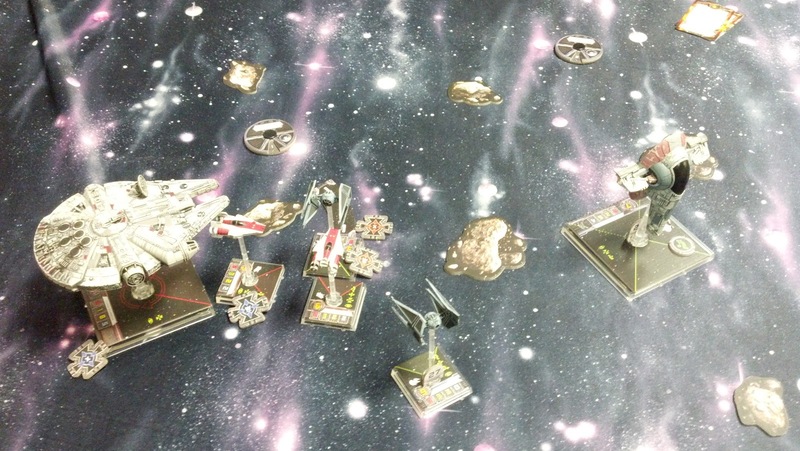 In this game my tactics and maneuvering were keys to winning since my list was not as good, so I pulled some maneuvering tactics I learned from playing Wings of war and I started by moving away from him forcing him to move more through the asteroids field. I kept making moves that were unexpected and forced him to react to my movement instead of the other way around, this was a great tactic. At the end of the game I destroyed all his ships and only lost some shield tokens, no damage dealt that game. 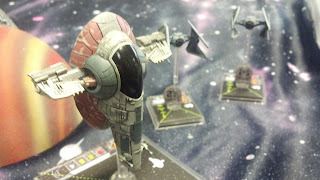 The 2nd game I played vs one of the few empire lists at the tournament. The list consisted of Darth Vader, Howlrunner, and 4 Academy tie fighters. 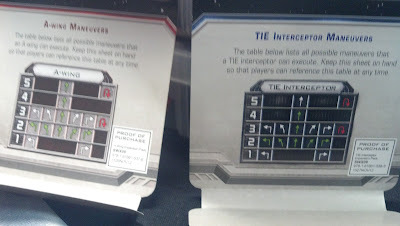 He cleverly put swarm tactics on Vader and howlrunner to boast 2 of his Academy Tie-fighters up to top levels. This was a game that I knew for sure was not going to end in the hour time allowed for the game, so I had to prioritize. First Vader then an Academy Tie fighter. The rules of the tournament is if you killed more points then your opponent you won and if the difference was 31 points or more you got the most amount of Victory points. I started the game knowing I was going to most likely lose something so Vader had to be target number one since he was worth 31 points by himself. In this game maneuvering was key. The game ended up much like the first game. I did the unexpected sharp right turn away from his advancing ships making him have to go through the asteroids to get to me, once again my off putting tactics worked, I killed Vader and one academy Tie fighter before the game was timed out. 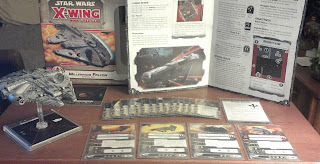 I took shield damage and only one of my gold squadron Y-wings had any damage and that was one point of damage. 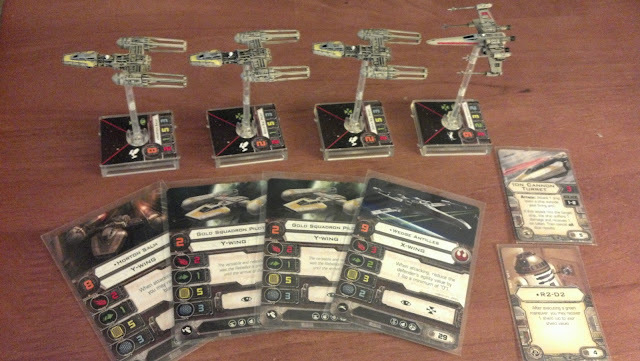 The third game was vs a list with 3 X-wings and 1 Y-wing an almost carbon copy of the first list I faced. Though he did not have the cool Biggs combo, though he had Biggs. He had some good tactics himself, he also used the Ion cannon well killing one of my gold squadron with it. 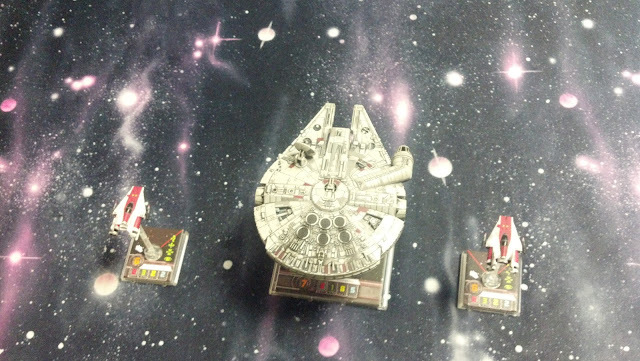 At the end I lost the one ship and took some damage, wedge re-charged 5 shield tokens during the game thanks to R2-D2 and I ended pretty much killing everything else. So after building a semi good list I ended up with the most Victory points and went to the winners match. I thought it was funny that I regretted the list so much right after I turned it in. But in the end it was less the list and more my ability to use interesting maneuvering tactics that made my army gain the edge. Its one of the few tournaments where my tactics were what won me my games over luck or really good power lists. Now for the interesting part you all been waiting for, the final game, this game. Now the kessel run tournament final game pits all the prizes into armies and has both sides duke it out, since I won I got to choose what side I was going to play. 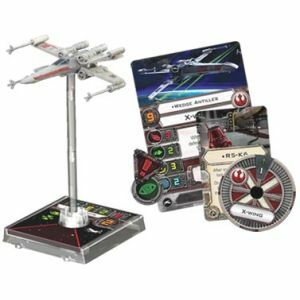 I wanted to play light side since if I lost I would not be getting the falcon since both of us really wanted that one as a prize that and i wanted to try it and A-wings out at the vary lest. So the lists were pre-set, and so were the cards. We got the boxes and it took about 1/2 an hour to open all the things and put them together. 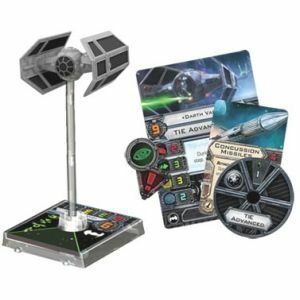 We were both careful to only punch out what we needed and to keep thing sorted because the A-wings and Tie-interceptors were going to be prizes for the lower rankings. 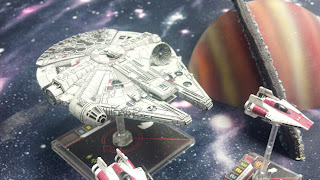 Though as the top 2 this game was pretty relaxed because we both realized that if we lost and did not get the falcon we would at lest get Slave one and that was an awesome prize in itself. The game was quick, I knocked down both Tie-Intercepters to one health right away with only taking one point of shield damage myself on a Awing. After turn 2 we had to call it since my opponent had to leave, but the game was going my way, next turn he would have had lost both his fighters and Slave one was kinda out of the picture since I maneuvered like i did in my first games so that he had to navigate the asteroid field. The large bases made the asteroids hard to move around and I was free to pick off his fighters. 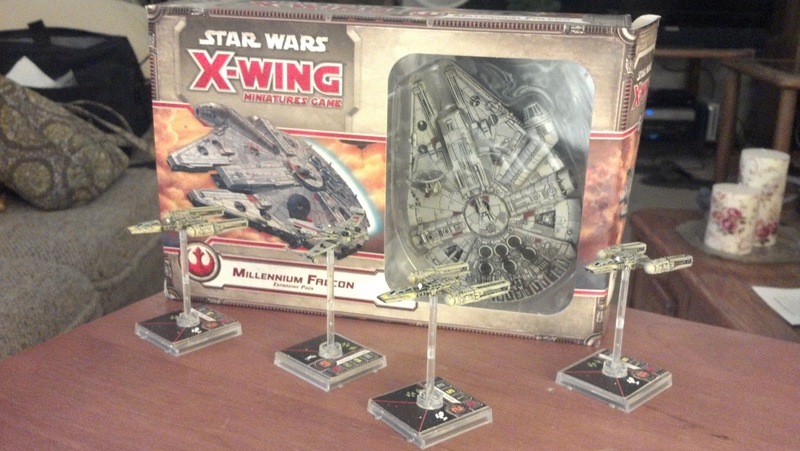 In my next blog I will go through all the things that came in the Falcon boxset! loads of photos to come. so stay tuned for that. Also a big thanks the Game depot for putting the event together, the prizes for the event was supposed to be the two big ships and 2 little ships leaving the left over 2 ships to the store organizer but the Guys down at Game Depot donated all the ships making the fist 6 places have prizes that was awesome. Great turn out of 16 players thanks to all who played all the games were fun. A big hello from your most recent follower and Love the blog As it looks like we have a few things in common, as I do have my own gaming blog at http://uniteallaction.blogspot.co.uk/ So all being well I'll hear from you soon. Tom UAA.